You should have no problems getting your fashion-drawing boys to dress up just the way you want them to (unlike the real versions). Sooner or later, a boy has to get dressed up for a holiday, a family party, or a school concert. Much to his displeasure, he has to put on a decent pair of pants and a blazer. A boy’s blazer is simply the mini version of a man’s blazer with simple lapels, two lower pockets, and one breast pocket. 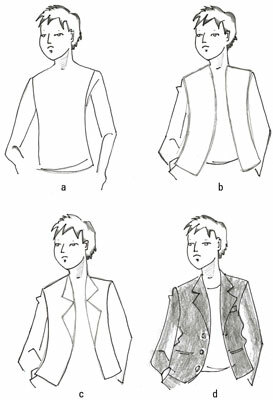 By using basic shapes, you can create the jacket that boys hate to wear! Draw the top half of a boy fashion figure and add in slightly curved lines for the armhole seams. A boy’s chest is not packed full of muscles, so draw it slim. Map out two curved rectangles for the front of the jacket, showing them a few inches apart for the jacket to be open. Draw in the sleeves. Draw slightly looser sleeves than you would for a man’s jacket and end the sleeves at the wrist bones. Add two triangles inside the inner edge of each curved rectangle for the lapels. Use a straight line to show pockets. Don’t forget the buttons and the breast pocket! Most blazers are of a dark hue, so shade in the jacket with the side of a soft pencil. Getting a little guy or tween boy to put on (and keep on) a tie in real life is a challenge, but fashion drawings don’t put up a fight, so deck out your young dude in a tie! Like a bow tie, a tie lies under the collar. Draw a boy’s head, neck, and shoulders. Sketch out two triangles for a shirt collar where the neck meets the torso. Draw a small square between the collars, just below where the triangles meet. This square represents the tie’s knot. 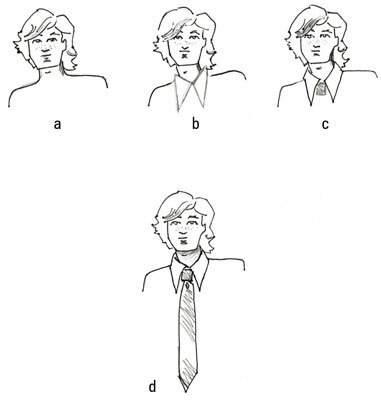 To draw the sides of the tie, draw short angled lines out from the bottom of the square. Extend the lines down and then angle them toward each other to form a point. The tip of a tie hits slightly below the waist.